I've always been very intrigued by this version of baked ziti - by the infallible Cooks Illustrated test kitchen - but the addition of cottage cheese in place of ricotta always frightened me. I mean - I don't hate cottage cheese - but I really don't eat it often and I've never used it in my baked ziti or any dish for that matter. But the test kitchen cooks are emphatic that you cannot substitute ricotta for the cottage cheese in this recipe - so I decided to give it a try. I never told anyone that I served this to that there was cottage cheese in it - and no one asked or wondered if anything was 'different'. I thought it tasted fantastic - it was cheesy, full of tomato flavor, and very fulfilling. I would definitely make this recipe my new stand-by baked ziti - and the perfect dish to feed a crowd! 1. Preheat the oven to 350° F (unless you are making this in advance). 2. Whisk cottage cheese, eggs, and 1 cup Parmesan together in a bowl; set aside. 3. Bring a large pot of water to boil. Stir in 1 tablespoon salt and the pasta; cook until pasta begins to soften but is not yet cooked through, 5-7 minutes. Drain the pasta and leave in colander. 4. Meanwhile, heat olive oil in a large skillet over medium heat. Crumble in the turkey sausage and cook until nearly browned (if using). 5. Add in the onion and garlic and continue to cook until the onion is softened and the sausage is completely browned. 6. Stir in the tomato sauce, diced tomatoes and oregano; simmer until thickened, about 10 minutes. 7. Off the heat, stir in 1/2 cup basil and the sugar, and season with salt and pepper. 8. In a small bowl stir together the cornstarch and milk. 9. Transfer the milk mixture to the now-empty stockpot over medium heat. Bring to a simmer and cook until thickened, 3-4 minutes. 10. 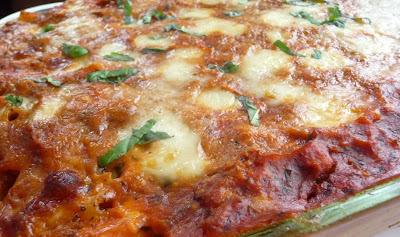 Remove the pot from the heat and add the cottage cheese mixture, 1 1/2 cups of the tomato sauce and 3/4 cup mozzarella. Stir to combine. Add the pasta and toss to coat thoroughly with the sauce. 11. Transfer the pasta to a 9×13″ baking dish and spread the remaining tomato sauce evenly over the top. 12. Sprinkle the remaining mozzarella and Parmesan over the top. Cover the baking dish tightly with foil and bake for 30 minutes. 13. Remove the foil from the pan and continue to cook until the cheese is bubbling and beginning to brown, about 30 minutes longer. Cool for 20 minutes. Sprinkle with the remaining 2 tablespoons basil and serve.